The word was out at Secret Beach as a sweet northeast swell turned the bay into a perfect wave machine. With lava-rock reefs close to shore, these guys can pick up a point-break without making a monster paddle. The break was rough on boards, breaking two and sending riders home early. 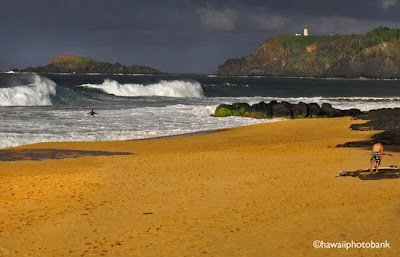 Secret (Kauapea) Beach is next to Kilauea Point National Wildlife Refuge, the lighthouse for which lords over the bay. A variety of seabirds strafe the white water behind the surfers, and it is common to see whales breaching and the local spinner dolphins cruising by offshore. Surfers must carry boards down a trail and hoof it across a long stretch of sand to catch these combers.